-Extend dual band WiFi up to 1200Mbps reduce interference. -WiFi Range Extenders boost your existing WiFi & deliver greater wireless speed, range & connectivity you desire for Ipads, smart phones, laptops& more. -Insert wall design, it can find the ideal location to achieve the ideal Wi-Fi coverage, no need to wiring simple and beautiful. -Restore all settings after power OFF¬Free to power ON/OFF. -Supports Router, Access Point ,Repeater, Client work mode. -Access User Interface by URL. -Supports set up by Phone UI. -Two Ethernet port enables wired connection. -External antennas for better WiFi coverage & more speed. -Quick Installation Guide helps with easy setup. LED Indicator:1*Power LED ,1 *LAN LED ,1 *LAN/WAN LED,1 *2.4G wireless LED ,1* 5G wireless LED,1* WPS LED ,3* Signal LED. Frequency Rangeº2.4G 2.412GHZ-2.484GHZ¬ 5G 5.180GHZ-5.885GHZ. Interface: 1*10/100Mbps WAN/LAN Ports ¬1*10/100Mbps LAN Ports. Button: 1 Wi-Fi ?On/Off Button, 1 WPS Button, 1 RESET Button, 1 Repeater/ Router and AP mode switch. Radio max wireless ratesº2.4G¬300Mbps/5G ¬ 867Mbps. Tntenna: 1*3dBi 5G antenna,1*3dBi 2.4G antenna. 【NEWEST WITH SEAMLESS ROAMING】- When you go from one network to another, smartly switch your device to the strongest network and maintain uninterrupted network connectivity. Keep your original browsing content. Not interrupted while playing or browsing the web. Provides a better surfing experience. 【EASY TO SETUP】 -Easily expand the wireless coverage by press the WPS button.Or set up via browser website based configuration.More easier to switch modes by press the button instead of traditional method that login the page to switch.Plug and play.Automatically to go into the setting page,reduce the tedious operation.Only 3 steps, you can finish the setting. 【HIGH PROFORMANCE】-Dual band WiFi up to AC1200 , uninterrupted WiFi that you enjoy in the far reaches of your home--even outdoors.Dual high gain 4dBi external antennas enhance wireless signals for stable data transmission.Ideal for HD streaming & gaming experience. 【3 IN 1 FUCTION】- With Router Mode, Repeater Mode, AP Mode.Works with any wireless network, router and Wi-Fi enabled devices including Smart home devices,Smartphone, iPhone, iPad, Laptop, Desktop, Smart TV, Smart Plugs and Smart Switch,etc. 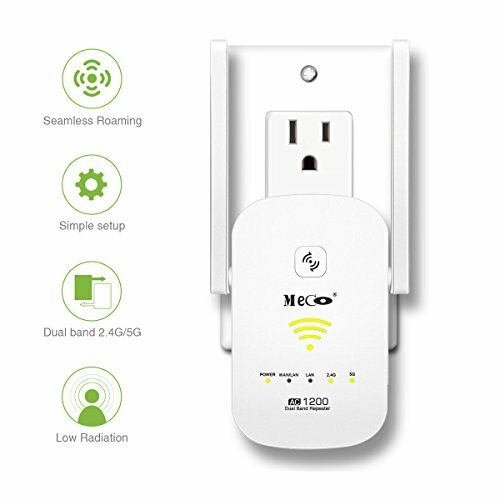 Covering the WiFi to your bedroom, floors, restroom, garage, basement and garden.Eliminate dead spots in your house. 【FAST NETWORK INTERFACE】-While boosting your existing WiFi coverage, the fast ethernet port can connect any wired device such as a smart TV, multimedia player, game console or PC to your WiFi network, work as a media bridge. If you have any questions about this product by MECO, contact us by completing and submitting the form below. If you are looking for a specif part number, please include it with your message.